From gift shop employees to restaurateurs to realtors, Carrboro business people overwhelmingly oppose the North Carolina marriage amendment. On March 15, the Chapel Hill-Carrboro Chamber of Commerce issued a formal statement encouraging its 1,100 members and their 80,000 employees to vote against the amendment, saying it would be bad for business. Nelson said he thinks that not only would the amendment make North Carolina seem unwelcoming to diversity but that it would also interfere with businesses’ abilities to provide insurance to their employees’ domestic partners. Carrboro, in addition to Orange County, provides domestic partner insurance benefits to its public employees. According to the 2010 U.S. Census, there are 570 unmarried individuals sharing a household with a significant other in Carrboro. He added that the chamber spoke with several companies in the area that said they never would have relocated here if what’s in the amendment had been the law at the time. He said the American Institute of Certified Public Accountants, which relocated to Chapel Hill from New York, was one of these companies. Jay Parker, one of three co-owners of Weaver Street Realty, said gays, lesbians and unmarried partners make up a larger portion of the population in Carrboro than most North Carolina cities, simply by nature of the local culture. Parker and the other owners have been allowing volunteers with The Coalition to Protect North Carolina Families to use their phones in the evening once or twice a week. “As a company we are actively opposed to the amendment,” he said. “We let this group use our phones and we tried to buy a sign but they’re sold out. “I guess that’s a good thing, that they’re sold out,” he added with a laugh. 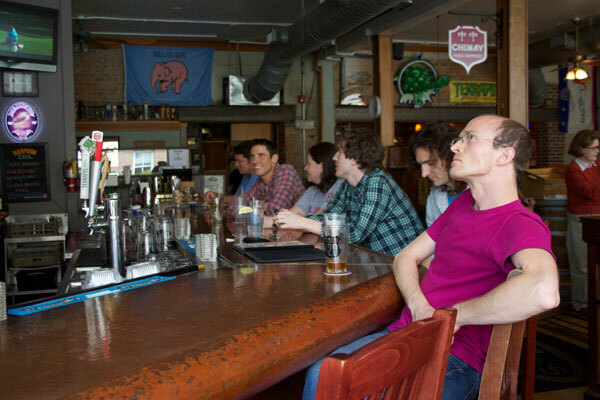 Erin Miller, the general manager at Tyler’s Restaurant and Taproom on Main Street, agrees that by nature Carrboro has a welcoming and diverse atmosphere and said Tyler’s is a reflection of that. Miller said she didn’t think the amendment would affect Tyler’s directly by limiting benefits the company already offered, but that it could have a slight impact by discouraging people from living and working in the area, thus depleting the customer base. Two blocks east on Main Street, past Weaver Street Realty, The Spotted Dog sports a “Business Against Amendment One” sign in the front window. The owner, Karen Mills, recently spoke out against the amendment in a YouTube video by The Coalition to Protect North Carolina Families. In the video, she discussed the amendment’s impact on students and said she thinks the amendment is a step backward. Across the street from The Spotted Dog, the owners and employees of This and That gift shop are buzzing about the amendment, too. “The owners – we’ve talked about it countless times – they don’t care whether or not you’re married, straight, gay, whatever,” said employee Stephanie Koenig. Koenig graduated from UNC in December and is leaving the country to teach English in Korea in June, but before she does, she’s voting “no” on May 8. Koenig summed up the general opinion saying she and the other This and That employees felt the amendment went against the culture and values of the town.